Grupo Bleydis is a young Company founded in 2009 by María Teresa Sarmiento López. The company was created as a mean to support artisans from the State of Chiapas and to join efforts to provide edgy and contemporary designs and turn them into unique and priceless pieces. In 2011, they released their clothing line featuring embroideries from Chiapas and in 2012 they released their shoes and accessories line also featuring embroideries from Chiapas. In Zinacantán, Chiapas, women have spent decades in the textile production and they have slowly adapted to the market, improving their quality as time goes by. Many indigenous women are participating in this industry. This allows them to produce higher amounts of products in less time. Textiles are one of the most important features of cultures from Chiapas as the knowledge passed from generation to generation is found within, and their embroideries reflect the history of a town through symbols and imagination. 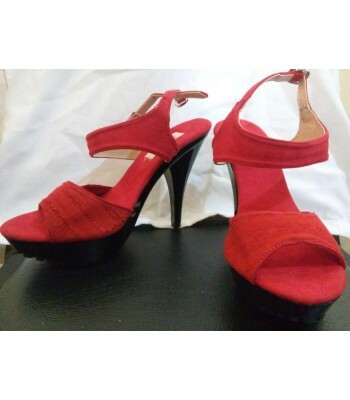 Comitán high heels shoes in red. Size 8. Comitán wedge sandals in silver. Size 7.